The DisposeRx Team and groups supporting our #CleanOutYourMedicineCabinet campaign have been busy and the results of our efforts are paying off. Inspiring people to change old habits is hard. This is especially true when it comes to convincing households the importance of cleaning out medicine cabinets of unused and expired medications. One of the best ways to spread the word is to start at the grassroots, working with local groups and professional organizations to educate their peers and their communities. Following are a few events that have taken place over the past few months by DisposeRx and others. 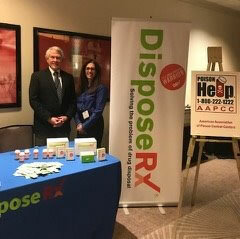 We wrapped up the AAPCC annual meeting in Philadelphia on February 26th. We were impressed by all the ideas and initiatives focused on preventing accidental medication poisoning, especially by children. According to statistics provided by Safe Kids Worldwide every 9 minutes a child is admitted to an emergency room in the US suffering symptoms of accidental medication poisoning. The average time an unused prescription sits in a person’s medicine cabinet is 3 years — that’s 1,095 days of opportunity for accidental poisoning or misuse. Giving families a safe, effective way to dispose of those ticking time-bombs is our mission. The DisposeRx Team sponsored the February 15th Carolina Hurricanes game. 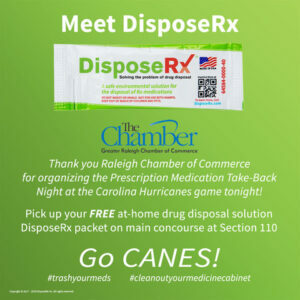 We had a great time watching the Canes play, meeting fans and giving out samples of our safe, drug disposal product. DisposeRx President William Simpson(r) is pictured in the image on the left with NC Department of Justice and Attorney General's Office Josh Stein (l) with Cane cheerleaders. 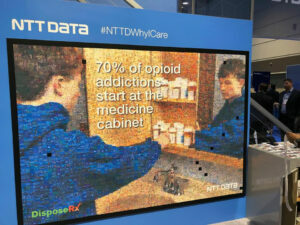 The DisposeRx Team had a great time taking part in #HIMSS2019 and working alongside NTT DATA Services to get the message out about proper medication disposal. Thank you to everyone who contributed their photos and stories using the #NTTDWhyICare to create the media collage pictured here to the left. 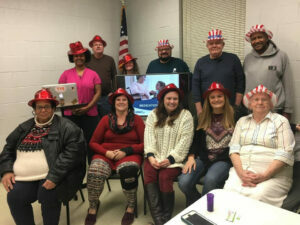 Shoutout to our friends at the Roane County Anti-Drug Coalition who took the message of proper disposal to the Roane County chapter of the National Council for Mental Illness. In addition to delivering tips on safe storage, the team also demonstrated how to use the DisposeRx product to safely and easily dispose of opioids and other medications. 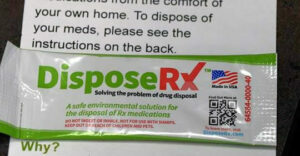 Schuyler County Public Health in upstate New York has begun distributing DisposeRX packets in their community as a weapon in the fight against the opioid crisis in Schuyler County. Thank you WENY-TV (Elmira) for helping to get the word out! Watch clip here. Thank you to our friends at the Roane County Anti-Drug Coalition who took the message of safe drug disposal to the kids at Bowers Elementary school. 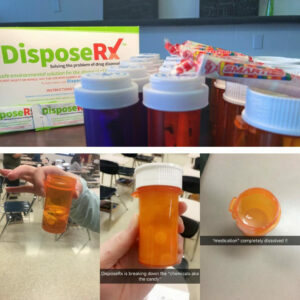 Using our easy site-of-use product, the students demonstrated how effective this process is for rendering excess pills unusable and they had fun while doing it! DisposeRx’s William Simpson and Ann Hamlin visited with eight graders and their families at the Paris Consolidated School in Kenosha WI presenting “Break the Chain – Stop Prescription Drug Abuse and Addiction.” This pilot program, developed by DisposeRx, focuses on raising student and parent awareness around prescription medication and the importance of proper disposal of unused prescriptions. 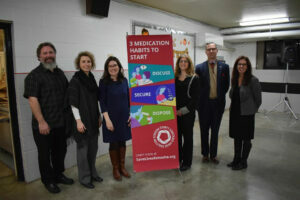 You can read more about “Break the Chain – Stop Prescription Drug Abuse and Addiction” initiative here.